I spent a most enjoyable day playing historic sleuth and running all over southern Ohio with Curator Jessica looking for (and finding) something I’ll write about when I don’t have white-line fever. I got a late start (what’s new?) and only made it just west of Covington, Ky.
I’ll tease you a bit with a quote: “I knew my grandfather about as well as any of his grandkids: I knew where he hid his whiskey.” When somebody tells you that over the phone, you HAVE to track him down. One side trip was to the Athens Cemetery on West Union Street. Jessica challenged one of my ancient photos as not having been taken there. I, of course, had to prove I was right. 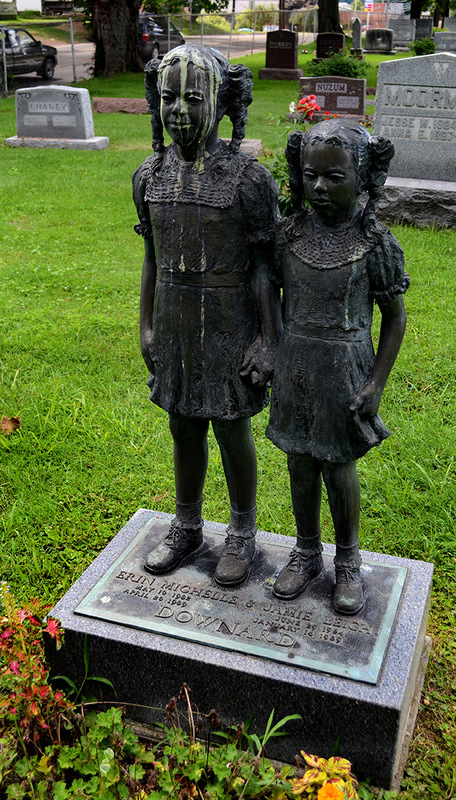 While there, she took me to one of her favorite grave markers: one for two sisters, Erin Michelle and Jamie Leigh Downard. Erin was born in 1982 and died in April 1989. Her sister was born in 1984 and died in January 1989. You have to wonder why two young sisters would be taken so close to each other. Was it a car accident? An illness? I guess that’s another one of those things I’ll have to look up the next time I get to Athens. This marker is unique, but not as heart-rending as the Downard sculpture. 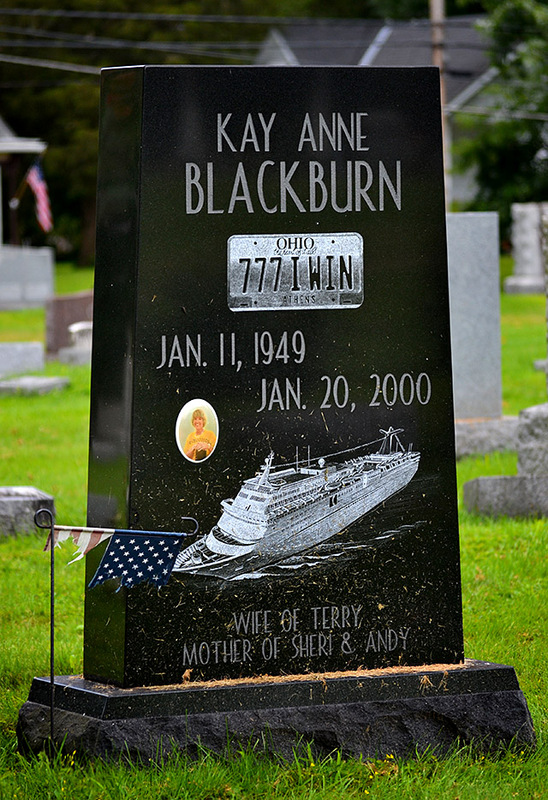 I’d love to hear the story behind the license tag etched on Kay Anne Blackburn’s stone. Ken, I didn’t know you were going to be so close to Cincinnati. I live just about 30 minutes north of Covington, KY. Next time you are this close and have an hour or so, let me know and my husband and I will meet you for a meal or something. Spring Grove Cemetery also has some very interesting grave markers. There is one of a little girl holding an umbrella. It is not in as good condition as the sisters, but it is very old. There are many others as well. Have a good trip. I love to read about your travels. One of my favorite parts of the trip to Mo. with Ken this winter was visiting the Civil War section of the graveyard (we hit several cemeteries) down around Dutchtown. I have several shots of gravestones there with elaborate stories on them that intrigue me. 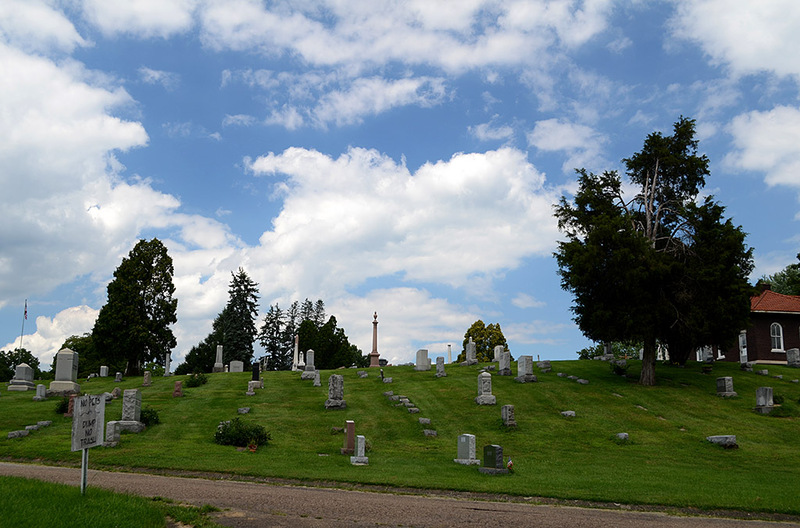 The other cemetery I liked was enormous – and on steep hills, somewhere in Ohio, I think. I can’t recall the name of the little town – they were all little. I shot stuff from the car window, but we didn’t walk much among those graves. 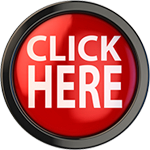 I love your blogs. I was wanting to hear more about the sister then the story was over.. So sad.. But I did like the Altenburg shots with the moon and that..
very tragic that two young sisters died so close together, I would like to follow his story and you gather more insight. Ken, you should learn the story of these two girls. I worked for their family when the girls were still living. They were very loved and well taken care of. From what I understand, it was a genetic condition from the pairing of the two parents and is very rare. They are a wonderful loving family. They own Downard’s Ambassador Laundry in Athens. They are also very private. I know that the girls were wheelchair bound from a very young age and I heard that their parents wanted to make the memorial in their likeness so that they would be standing. I can not do their story justice but it is a beautiful memorial. The last time I was in Athens, Curator Jessica and I tracked down the girls’ father at the laundry to ask if he would mind telling us the story behind the grave marker. Your version is essentially correct. One daughter had the genetic condition and the family had to watch her gradually deteriorate until she died. That’s when they discovered that her sister had it, also, and they knew they would have to go through it again. It was tough for the father to talk about, and it was also very hard to hear him describe it. I just couldn’t bring myself to write the story. That’s one of the nice things about being retired: you get to pick and choose. 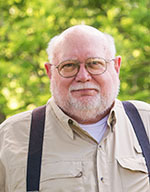 I have three grandsons. I pictured them in Mr. Downard’s situation and couldn’t peck the keys. Thank you for filling in the missing pieces. How beautiful that the girls are standing in this memorial. 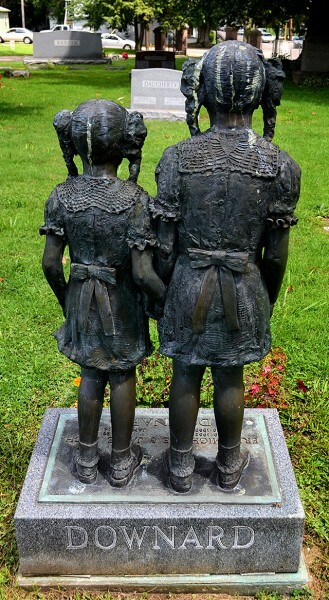 It wrenched my heart to see the statues of two so young to begin with, and then to hear their story left me in tears. My heart aches for their parents. Two such devastating losses is more than a mere mortal’s heart is designed to handle. It is so gracious that they shared their story. God bless their whole family. Thank you for that much of the story. I would have wondered forever.